The next year – 1983 – the campout was held at Natural Chimneys, near Mount Solon in Virginia’s Shenandoah Valley. 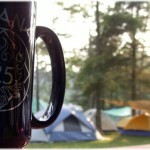 In 1984, BRANA 3 was held at Montpelier Campground. 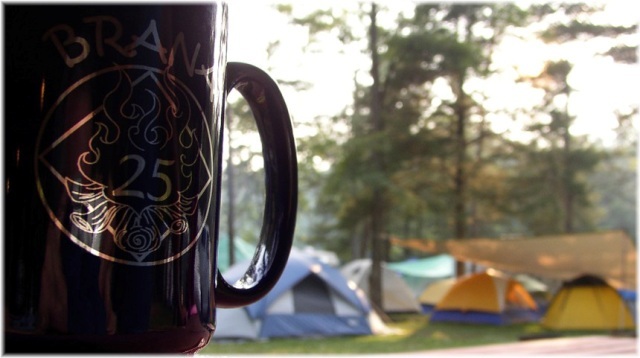 From 1985 to the present, BRANA has held its annual campout at Natural Chimneys. Christine O., Chesapeake, VA…Even if I don’t make anything else, I’m coming to BRANA. I feel really centered here and I feel close to God. Kelley D., Roanoke, VA…It will let you know that you can have fun in recovery. Take time to lay on the rocks in the river and thank NA and your Higher Power. It definitly is a God thing. Michael M., Milton, DE…It’s an opportunity to meet people. And there’s something that brings God into the equation. Joe B., Virginia Beach, VA…I probably go to seven campouts and conventions a year. BRANA has always been a great experience. Rhett C., Richmond, VA…I do about four or five campouts every summer and a lot of people consider this one the best. It’s a really good experience for newcomers. It’s a way of connecting. Ken J., Richmond, VA…I’ve been coming here for the past 10 years. This is probably one of the better campouts in NA. Attendance at the campout averaged about 200 people for most of the decade of the 1980s and into the ’90s. As BRANA 13 approached in 1994, the Blue Ridge Area had become a virtual non-area. People had moved away or gotten resentments and participation dwindled. In March of that year, Jason B. went to a regional service meeting in Winchester, VA. People asked about the BRANA Campout; no one had seen a flyer and word of the area’s problems had spread. Jason was elected special events chair and the Region of the Virginians (now the Central Atlantic Region) co-hosted the campout. “It’s turned out really well,” Jason said. “We give the campground a lot of money and have enough to do it all again next year.” The BRANA Campout is fully self-supporting and does not rely on fundraisers, he added. Jason served as campout chair for more than a decade. Becky T., Raphine, VA…I love the clean-time countdown and when we all get in a circle and you see how many people are really here. George E., North Oxford, MA…We all get together, eat together and sleep right next to each other. And if you think no one can hear what’s going on in your tent – we know! Marie P., Milton, DE…Next year, we’ll have to get here on Thursday. The campout’s growth brought new issues. Campsites intended for two tents and four people had as many as six tents and 15 campers. It’s difficult to pack people into a campground like sardines in a can and expect them to have a good camping experience. And expect them to come back next year. 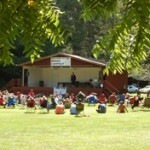 In July 2006, more than 300 people, plus about 80 children, attended BRANA 25. It was the first expansion beyond the J-Loop, as the campout included the 15 campsites in the F-Loop. That did little to alleviate the crowded conditions and in 2009, the BRANA Campout Committee leased the entire campground from Natural Chimneys. In addition to having more room to spread out, the stage was included, along with additional shelters, restrooms and bath houses. With the added space came added expense. In 2004, the campout committee paid $2,500 to lease the J-Loop for BRANA 23. By 2010, that figure had increased to $6,200 for BRANA 29. Steve A., Staunton, VA…This is one of the best parts of NA. It teaches the newcomers and everybody else that you can have fun and stay clean. Kathy S., Texas…That many people clean is an amazing sight. Even though some of us are shy, you feel a bond with other people here. It makes you realize that you’re not alone. John A. Manassas, VA…This is my first time at BRANA (in 2004), but I’ve known about it since 1985. Beautiful. super nice job on the site! Way to go on blogging! What an awesome tool to reach out and keep the fellowship connected during the year! Thank you! I have had to work every weekend of BRANA ever since I got clean in 2005. This year I will be in attendance!!!!!! Very nicely done. Proud to be a member of this beautiful experience. This will be my 7th! Excited for my first year!